Muja had tummy infection again. Placing a feeding tube directly into the stomach. 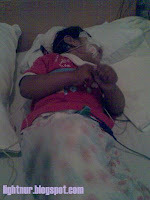 Muja second sleep study at Princess Margarate Hospital.